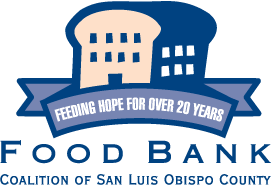 Food Bank Coalition Of San Luis Obispo County- Our partner charity for the Munchkin March! For the past 3 years, the Munchkin March Parade has benefited the Food Bank Coalition of SLO County; we look forward to working with them again this year. Why the Food Bank? They work really really hard providing members of our community with food. Did you know that 1 in 6 people in our county reached out for help last year? That is 44,000 of our friends, neighbors, and coworkers. The Food Bank Coalition keeps a very low overhead- less than 5%- which allows them to turn every $1 donated into 7 nutritious meals. For every $1 donated the Food Bank Coalition can provide $10 worth of food. Fruits & Vegetables: canned or dry fruits and vegetables in an array of colors will help ensure consumption of many vitamins and minerals. Grain Group: whole grains provide maximum nutrition value and long-lasting energy. Protein Group: Lean meats and canned or dry beans provide the necessary fuel for muscles.